In 2006 Chris Larson sent me a puzzle. It had T. argentina x ?didisticha Neville Ryan 1001 on the label. It is slow growing in Adelaide conditions and has just flowered. It seems that Neville grew seed from the BSI seed bank called T. argentina but the resultant seedlings did not look like the species so who was father. Father could well have given us the white flowers but whether it is T. didisticha is conjecture. There are at least 4 collections in Australia that have this plant and the time has come to give it a cultivar name. As an aside, Eric Gouda saw similarities with the mysterious T. pfeufferi, which is an enigma in itself, but a wild phenomenon. Now to a letter I got from Walter Till in 1997. Thank you for your letter from 26 February and the pictures of the Knize plant. The figured plant is doubtlessly interesting but I do not believe that it is T. pfeufferi which in my eyes is a natural hybrid between T. lorentziana and T. vernicosa. The leaf morphology of the plant figured in Trop. Subtrop. Pflanzenwelt 65: 62, Abb. 39 links (“1988", Mai 1989) is strongly resembling that of T. vernicosa while the inflorescence is that of T. lorentziana which can be simple. Petals are usually white in both species. However, occasionally violet flowering T. lorentziana has been found. 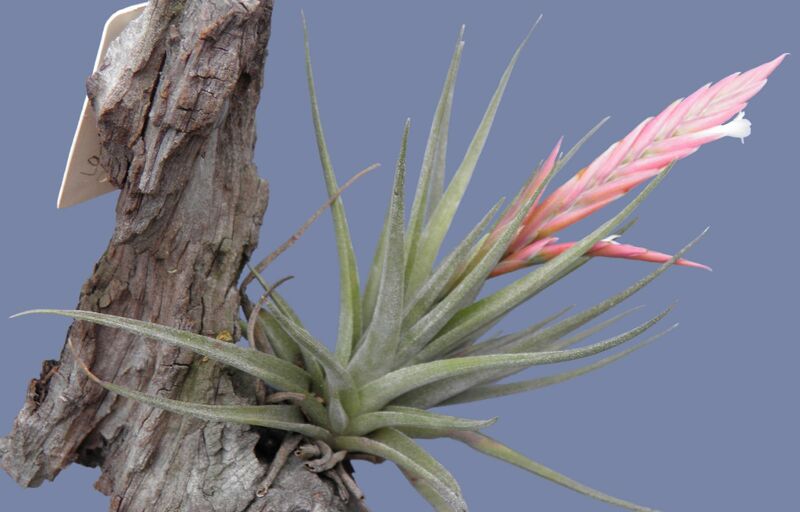 The plant in your pictures belongs to the alliance of T. lorentziana and is very close to T. zecheri. Except of the secund leaves and the pale violet petals I cannot see essential differences to the latter. I know your plant from a collection from south Bolivia, from the area between Camargo and Culpina, 3200 m s.m. 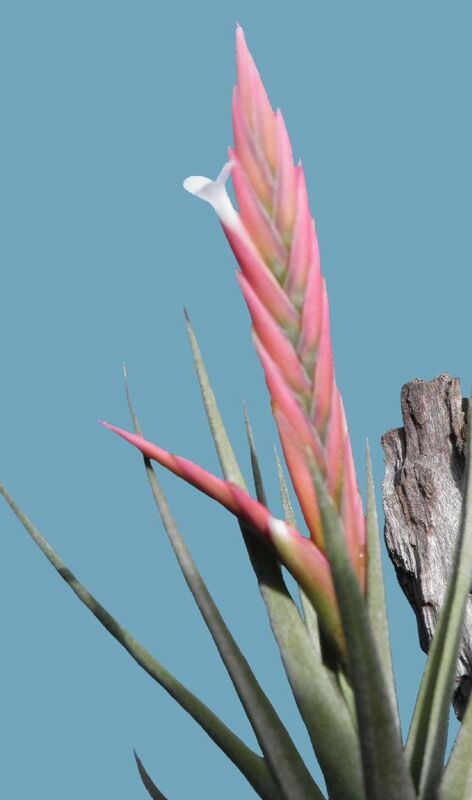 This is at higher altitude than are the localities of T. zecheri and of its var. cafayatensis in Argentina but is not dramatic as the Bolivian locality is somewhat nearer to the equator and vegetation is going correspondingly higher upwards the nearer one comes to the hot tropics. Anyway, a careful examination of the characters of your plant and comparison with T. zecheri should be made. Perhaps your plant merits the status of an own variety. According to my opinion, however, your plant is not T. pfeufferi. The Knize plant went on to become T. ‘Pfantom’ and is in Australian collections as is the infamous T. pfeufferi having been imported from Heidelberg. Could the father of our plant be T. vernicosa and not T. didisticha? Life was not meant to be easy! Years ago I got a plant with T. argentina on the label and clearly a seedling, from Maurice Kellett in Victoria which offsets profusely but never flowers. I have given away many offsets with the plea, “Tell me if it flowers!” I called it 'Evita’ because of its links to Argentina and the song 'Don't cry for me!’ because of the disappointment. It has a flower spike similar our NEW find which had me taking yet another check for a flower! Because of these links we should call it 'Evita Plus' because at least it does flower. Plant 15 cm wide, 12 cm high, leaf sheath merges with the blade, 1 cm wide, green with scales, peduncle 2cm long, inflorescence up to 3 spikes, terminal spike to 7 cm long and 1 cm wide, petals white, stamens included.